Hand made cards, boxes, and 3-D paper crafted items I get to create in my little corner of the world......Thanks for stopping by to visit. I don't know about you but it is looking a lot like Christmas in my studio - vinyl is being cut for pillows that will be gifts, cards and Advent Calendars are being made.......all of that started in late August and now it is already October. To stay a little ahead I have been working on some Christmas cards - this week I decided to color up a sweet image of baby Jesus from Bugaboo Stamps. 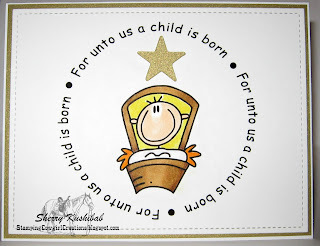 Keeping it simple I used my Silhouette Cameo to create the words in a circle, Baby Jesus is a digi stamp colored with Copic markers and placed in the center of the sentiment. 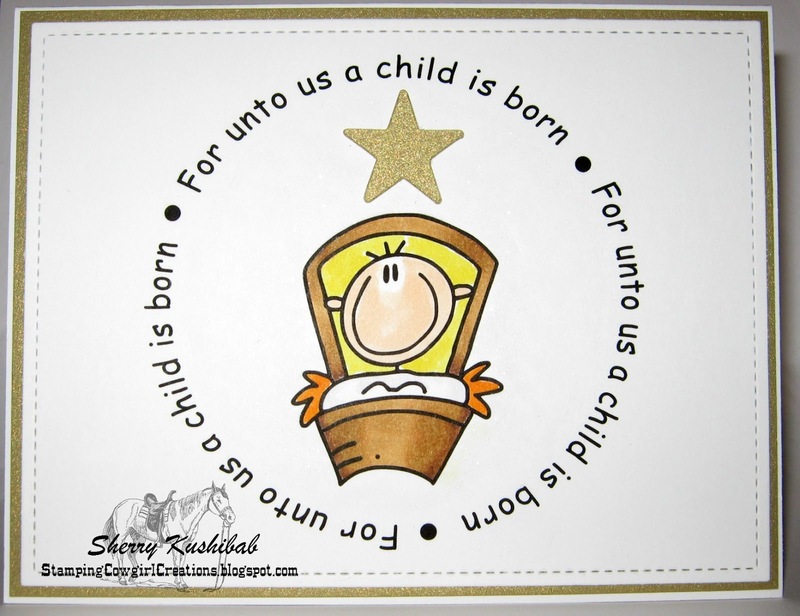 After printing it out I used the Stitched Edge Lawn Fawn die to cut the rectangle and highlight the edge of the card - and small gold die cut star was placed above the baby. What you can't see in the picture is the Wink of Stella Clear that I used to highlight all around the digi image extending out to just inside the words....a lovely little hint of sparkle to surprise the recipient when they take the card from the envelope. As someone who likes to create 3-D projects and embellish cards I had to work hard to keep this simple. 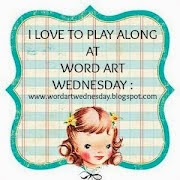 It works well because the image is so childlike and sweet and doesn't need much more than the message that surrounds it. Thanks for looking have a great day. Follow by Email - to receive updates when I post. This is my personal blog. Samples, text and designs I post on this blog are for your personal use only and not for submission to any contest entry, publication submission or for your monetary gain. Pictures may not be copied and used on another website or publication without my my watermark..to do so otherwise you need written consent. Use them as inspiration and not for personal reproduction. My little corner of the world - blessed to have a fab place to play! !